← It’s a Facebook Launch Party & You’re Invited!! Carrie Padilla wished she could crawl back into bed. Maybe, under it. Any day that included a cop on her doorstep didn’t promise to be a good one. A policeman appearing at the crack of dawn spelled disaster. There must be some mistake. The hope prompted her to peek through the peephole a second time to examine the identification she’d demanded. Her heart racing, she sucked in one short, shaky breath of air. Then another, longer one. Her head spun with the effort, so she had to settle her forehead against the door. 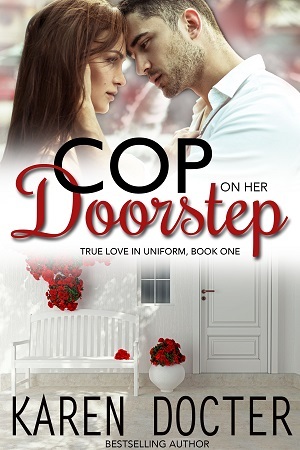 She couldn’t chance a one-on-one confrontation with a uniform again. Not this close. She may have beaten the impulse to fall apart every time a siren sounded in the distance or a police car appeared in her rearview mirror, but did she dare test herself with closer contact? “If you’d like to call the station, Sergeant Grenich will vouch for me.” The voice was deep, authoritative, impossible to ignore. Opening the door wouldn’t be her first choice. Then, neither would it be second or third. But Officer Jake Stefani wanted to speak with her and she didn’t have an excuse for turning him away. At least, no valid excuse. Her fingers fumbled with the safety chain as she glanced down at her sweaty exercise gear. Sports bra, covered by the sleeveless Colorado Rockies T-shirt her husband bought her before he died. Her old running shorts, a tad less loose thanks to her recent make-up-for-the-loneliness, chocolate-peanut butter ice cream splurges. Running shoes with low-cut athletic socks. She wore less to the local swimming pool, so why did she suddenly feel so naked? She was afraid it was due to more emotional reasons than physical ones. The problem was she didn’t have the nerve to ask the man outside to wait until she was better able to cope. He wasn’t likely to wait forever. Unable to avoid the inevitable any longer, she threw open the door while one trembling hand tucked tendrils of damp, auburn hair back into her ponytail. Disconcerted to find herself nose to chest with the policeman, she stepped backward, her desire to bolt suddenly stronger. At only a few inches over five feet, she’d experienced her share of “tiny attacks” in the past, but never with this kind of intensity. Amazingly enough, the uniform didn’t cause the problem. The man behind it did. Although he couldn’t quite lay claim to six feet, his crisp, dark blue shirt clung to a broad chest, his trousers molded to muscular legs. He didn’t have the brawny physique of a body builder though, more the sleek, leashed power of a man trained in martial arts. Good heavens, but his biceps looked strong. Rock hard. Something distinctly feminine within her quickened. Were arms like those capable of tenderness? A woman would feel safe there, secure, if she wasn’t crushed to death first. Chasing the unruly notion away, she gazed elsewhere. The dark shading of the man’s square jaw suggested a beard needing two close shaves a day. His full lower lip was sensuous and bound to cause heartache, if a woman weren’t tripped up first by the mischievous bump of a slightly crooked nose. She blinked when she reached the kindest, warmest brown eyes she’d ever seen. They were the same rich shade as Swiss chocolate. Soft. Mouthwateringly tempting. Wow. Too bad she was on a no-man diet. Her insides vibrated to the sinfully deep rumble of his voice before she could clamp down on the new sensation. “I’m Carrie Padilla.” Please have the wrong woman! Carrie’s eyes widened. The boy who edged into sight from behind the officer’s bulk couldn’t possibly be her son. This boy appeared too small, too grimy, and he wore a familiar red windbreaker and an unfamiliar, guilty expression. She turned to stare up the flight of stairs behind her. Her heart sank. “Eric,” she whispered, wondering when her son had sneaked from the house. She’d been up for several hours thanks to her recent bout of insomnia and Eric hadn’t passed her bedroom door while she ran on the treadmill. He hesitated, but then took a seat on the couch. Her gaze jolted the length of the couch. “My husband is dead,” she said. Six years should have dulled the ache of her loss, but she was dismayed to hear it blurted out loud. Who knew she’d need all her defenses in place before six a.m.? 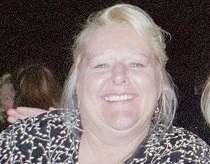 Amazon Bestselling Author Karen/K.L. Docter writes two different kinds of romance novels…Contemporary Romance w/a Karen Docter and Romantic Suspense w/a K.L. Docter. **SPECIAL GIVEAWAY**: Karen is giving away a $10 Amazon Gift Card to one lucky reader who comments on her **Author Special** Interview or Karen’s Killer Book Bench blogs. Don’t miss the chance to read this book! I hope you like it, Robin! Happy Reading! Love this excerpt!! COP ON HER DOORSTEP sounds great! You know I enjoyed this book, hope to read another of your books. Thanks for stopping by to tell me how much you enjoyed the book. You’ll be happy to know that I’m working on it’s sequel, COP CRASHES THE WEDDING. Rick is one of Jake’s co-workers at the station. I’m aiming for an August/September release.